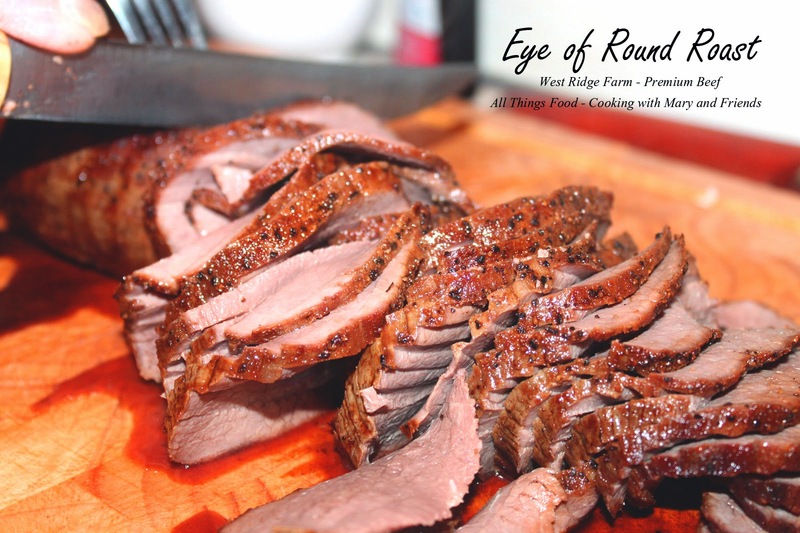 By far the BEST Eye of Round Roast I've ever had and it started with grass-fed beef from West Ridge Farms - Premium Beef where I had the pleasure of meeting owner, Adam Frick, and touring his awesome farm earlier this year. And what they had to say about their beef was important to me "We guarantee that our beef is free of all steroids, added hormones, and antibiotics. Our cattle are raised entirely on pasture and are not confined or sent to feedlots." Read more about this awesome farm here. When considering roasting this Eye of Round Roast, I had read many interesting recipes online, and had a few ideas of my own. I didn't want this roast to be a "pot roast," but rather a true, roasted beef we could enjoy for dinner then use for French Dip Sandwiches another day. 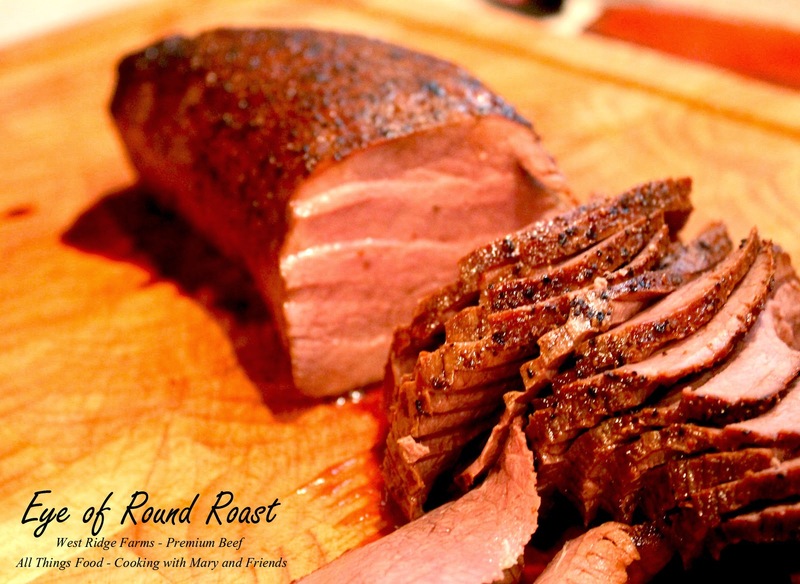 Eye of Round Roast is not known to be the most tender cut of beef. The eye of round is a cut from the round steak section of a beef hind quarter. A round steak actually has 3 different "cuts" in it that you can buy at the grocery store. 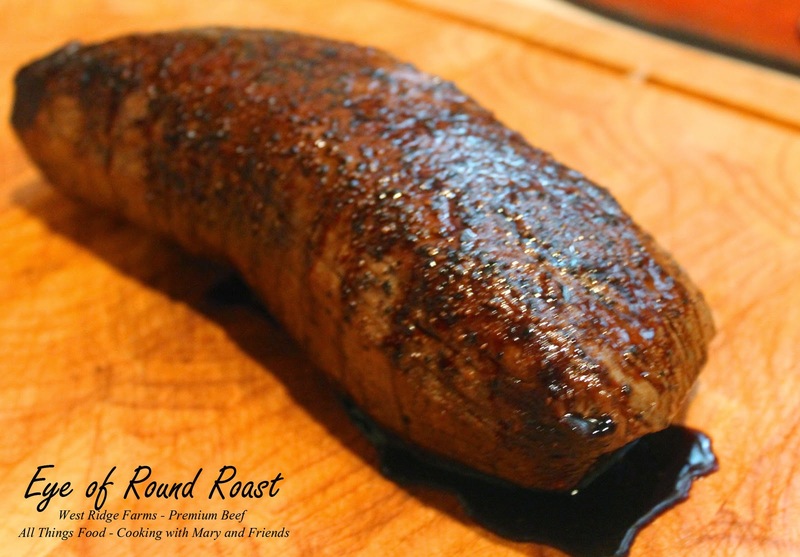 The bottom round (which can be labeled a London Broil roast), the top round (usually a steak), and the Eye of Round (sold either as a roast or a steak). Of the 3 parts of a round steak, Eye of Round is the most tender (BUT, it is NOT as tender as a rib eye). So, after researching things a bit more, I found a way to roast this beef, and make it come out juicy and tender. How? High Heat Roasting and it turned out perfectly! Preheat oven to 500 degrees. Remove roast from refrigerator and rub liberally all over with salt, pepper and garlic. Let rest 30 minutes. Place roast in a large roasting pan, fat side up, and roast in oven 7 minutes per pound, or approx. 25 minutes. Turn oven off completely, yes, TURN OFF OVEN, and leave the roast in the oven for 2 1/2 hours. After 2 1/2 hours, take the roast out and check its internal temp with an instant read thermometer. The temperature should be about 130 degrees. Put the finished roast on a plate and cover it with tin foil, and allow it to rest for 10 minutes. Serve immediately. If you have any concerns your oven won't hold the heat, reduce the oven heat to 170 (after roasting at 500 for the 25 minutes) and check roast after one hour, then every thirty minutes afterward for desired doneness.